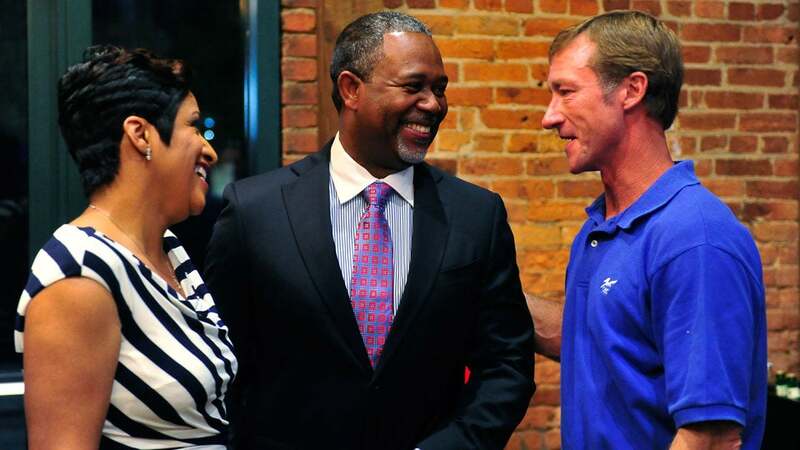 Hardie Davis, center, with his wife Evett during his election night party in 2014. Congratulations on another fine Masters Tournament. I haven't been a golf writer for long, but I can tell this event is a cut above. The course is beautiful. The patrons are friendly. The leaderboard is packed with talent. I'm even enjoying the pressroom food. Bravo. Would you please invite Hardie Davis to play the course? Davis is in the second year of his first term as mayor of Augusta. I visited him in his office in the newly renovated Municipal Building on Thursday before he slipped out to the course to catch the last few groups. He was wearing a grey shirt with an embroidered Masters logo and talking excitedly about the perfect weather conditions and the prospects of the city's homegrown golfers: Patrick Reed (who led Augusta State to back-to-back NCAA Championships) and Vaughn Taylor (a native son and PGA Tour journeyman who recently won his first event in more than a decade). But when I asked him if he had played his city's iconic course, his answer surprised me. "I have not had the opportunity to play there yet," Davis said. "But I'm hoping that happens in the near future." So how 'bout it, Mr. Chairman? Beyond the gates of the club, the city is facing serious challenges. According to the U.S. Bureau of Labor Statistics, the city's unemployment rate still outpaces both state and national averages. Median household income was $46,689 in 2014. The population is shrinking, threatening Augusta's status as Georgia's second largest city. In 2014, Davis became the first African-American to be elected to the office since the consolidation of the (historically black) city and (historically white) county governments in 1995. He carried nearly 75 percent of the vote, a clear mandate for change, but as he set out to create "One Augusta that works for all of our citizens, not just a select few," he soon discovered that those wheels turn slowly. "My election was considered ‘historic,' so many people, white and black, think Hardie Davis is coming to transform Augusta," Davis told me. "Winds of opposition came from individuals who are comfortable with Augusta as they've always known it." His vision is hardly revolutionary. Davis wants to unlock the city's potential by training a workforce for increasingly technical high-wage jobs in cyber-technology, healthcare and manufacturing, and the vaguely populist rhetoric of his campaign has already transitioned into a call for unity. "The narrative in the past has always been that it's South Augusta versus West Augusta," Davis said. "But if Augusta is going to have a richer and brighter future, we're going to have to move beyond those silos and say, 'You know, at the end of the day, we rise or fall together.'" Which brings us back to Augusta National. The club is without question the city's most important institution. Estimates put the economic impact of the Masters on the city well above $100 million. Davis praised the club's community outreach efforts, calling you, Mr. Chairman, a "tremendous visionary." "I don't think there's a narrative where Augusta National just shows up and does its thing," Davis said. "They are very in tune with what's happening in and around the community, and they're making an impact beyond that one week." "It's a Southern town," said Nancy Glaser, the executive director of the Augusta Museum of History, which captures the history of this textile mill turned tourist destination. "I think there are people who are really working at better communication, it's happening more and more, but does [racial tension] still exist? Absolutely." The mayor described his city's relationship with the club as close but "quiet." A round of golf could change that. This small gesture could make a big statement: the city's divided days are in the past. Davis could tell you about the first time he went to the Masters in 1999. He had lived in Augusta for 14 years but had never attended the tournament. He drove his father, a Georgia Power retiree, down Washington Road in a convertible, basking in the first taste of spring. They followed Tiger Woods, who had lapped the field two years earlier to become the first player of color to don the green jacket. He now relishes the opportunity to share the same experience with his son each year. Isn't that what "a tradition unlike any other" is all about? P.S. Davis plays to a 16 handicap, Mr. Chairman, so you'd need to give him some strokes.